분청사기로 만든 태(胎) 항아리로, 1970년 고려대학교 구내에서 건축공사를 하던 중에 발견되었다. 태 항아리는 주로 왕실에서 태를 담기 위해 사용되었으며 내항아리와 외항아리로 되어 있다. 내·외 항아리 각각에 뚜껑이 있으며, 높이 26.5㎝, 입지름 9㎝, 바닥지름 9.5㎝인 내항아리와 높이 42.8㎝, 입지름 26.5㎝, 밑지름 27.6㎝인 외항아리로 되어 있다. 외항아리 안에는 흙이 3분의 2쯤 차 있고, 내항아리는 짚 망태기에 넣어져 외항아리에 담겨 있었다. 내항아리 안에는 태(胎)와 태를 싸았던 것으로 짐작되는 것이 썩어 변질된 채로 남아 있으며 엽전 2닢이 들어 있었다. 외항아리는 풍만하고 내항아리는 홀쭉하다. 외항아리의 무늬에는 어깨에서부터 卍자무늬, 연꽃무늬, 국화무늬로 둘렀으며, 몸통 전체에 국화무늬를 찍어 놓았고, 몸통 아래부분에도 어깨 부위와 같은 연꽃 무늬로 띠를 둘렀다. 내항아리는 뚜껑에 육각형 무늬가 있으며, 몸통에는 국화 무늬가 가득 차 있다. 이 항아리들은 15세기 중엽 인화문(印花文) 분청사기의 가장 세련된 작품 중에 하나이다. These two lidded jars come in a pair, with the smaller jar designed to fit into the larger one. The smaller one has a height of 26.5cm, mouth diameter of 9cm and base diameter of 9.5cm. The bigger one has a height of 42.8cm in height, mouth diameter of 26.5cm and base diameter of 27.6cm. When these jars were excavated, two-thirds of the bigger jar was filled with clay. The smaller one was wrapped with straw and placed inside the larger, outer jar. Additionally, a rotten umbilical cord wrapped in a piece of unknown material and two old brass coins were found in the inner jar. The outer jar is wide and the inner jar is narrow. 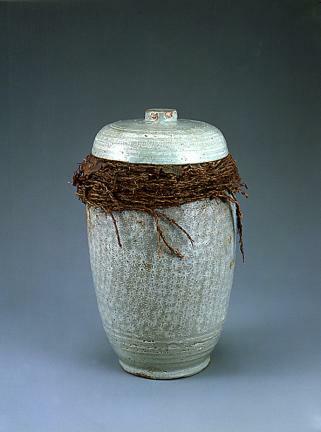 The outer jar is decorated with lotus flowers, chrysanthemums, symbols of Buddha and thread-like raindrops. There are lotus flower patterns in the shape of a belt on the lower part of the larger, outer jar. On the cover of the inner jar is a hexagon pattern in the shape of a tortoise. 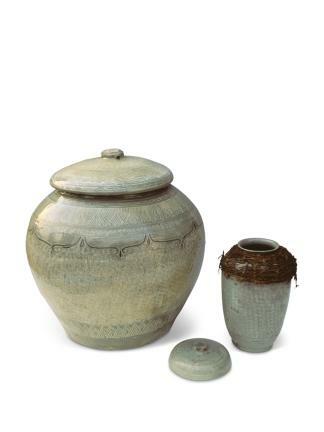 These jars are regarded as buncheong (celadon) masterpieces, which were primarily produced in the mid-15th century. 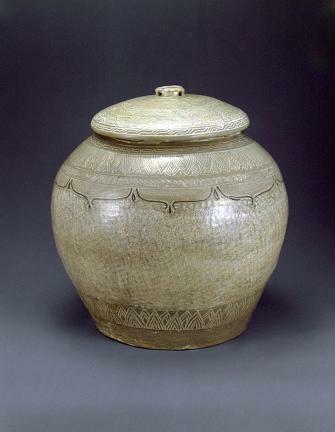 This type of jars was used particularly for storing an umbilical cord, an ancient tradition of Korea that was practiced in order to supplicate for the health and well-being of the new born. A tombstone near the excavation site is inscribed with a description of the death of both the mother and newborn baby.